The program selector button allows you to choose between drive programs with different driving characteristics. In AMG vehicles, drive program E is called drive program C.
When the engine is started, the automatic transmission always switches to automatic drive program E (drive program C in AMG vehicles). For further information on the automatic drive program, see . 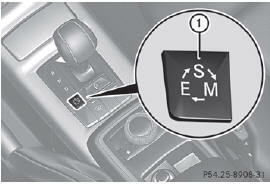 Only change from automatic drive program E or S to manual drive program M when the vehicle is stationary. ► Press program selector button 1 repeatedly until the letter for the desired gearshift program appears in the multifunction display.